Sparkle under the dance-floor lights in this rhinestone-embellished classic long prom dress for prom 2019. 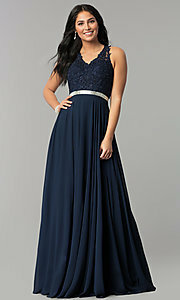 Perfectly priced at under $200, this a-line formal dress will help to keep you on budget. 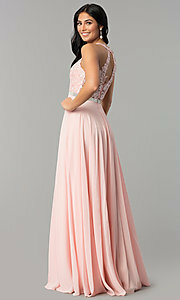 The sleeveless embroidered-lace bodice of this charming chiffon prom dress has a v-neckline and a teardrop-shaped back cut out. Ending with a floor-length rolled hem, the long chiffon skirt begins at the rhinestone-banded natural waistline and falls in an elegant draped a-line shape. Be the belle of the ball in this ultra-feminine long prom dress for prom 2019! The model wearing blush is 5'9.5" and wearing 2.5" heels. 64", Hollow to Hem 60"